How often do you sit down in front of your steaming dinner plate and realize you are lacking vegetables? By the time you get through all your fixings, it’s hard to get your daily recommended dose of veggies too. The good news is some vegetables are very versatile. Even if you don’t like steamed or raw veggies, you can get creative with how you cook vegetables to make them savory additions to any dish. One of the most versatile veggies out there is squash. This bright orange gourd can be molded into the main dish or delicious side. Here are a few spins on squash that might surprise you. For a healthy snack that will complete any meal, try pickling squash. Slice the squash and use slightly sweet vinegars such as apple cider vinegar or rice wine to bring out the squash’s natural flavor. Every vegetable is better in a light, crispy batter, including squash. Slice your squash into long, 1/4-inches thick pieces so they cook quickly enough to be soft and savory in the tempura batter. For a nutritious spin on an American classic, use butternut squash puree for your cheese sauce base. Creating this cheesy topping is simple, just puree butternut squash with a few handfuls of your favorite cheese, a dash of cream, and two tablespoons of butter, toss with your noodles and add salt and pepper to taste. This is bound to become an instant staple in your home. Yes, you read that right. Vegetarians and vegans have gotten creative with their steak dinners, but squash steak is sure to become a favorite for veggie- and meat-lovers alike. To make this meal, slice the long top-half of the squash into 1- to 1 1/2-inch-thick slabs, season generously, and follow your typical steak preparation procedures. Butternut squash makes a delicious, sweet puree that can be added to many of your favorite baked good recipes. 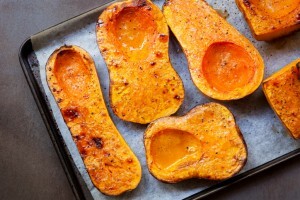 Simply roast the squash until it’s soft, peel, and then blend it. Use it in a bread recipe for a moist, autumn-y bread or use squash puree as a substitute in your favorite pumpkin recipe. Embrace this unique take on an Italian classic with butternut squash gnocchi. This dish is surprisingly easy to make (try this gnocchi recipe with sage brown butter from Bon Appétit) but makes an impressive, colorful dinner for you and your better half to enjoy on a romantic night in. Use squash to put a spin on some of your favorite desserts. Toss in a little brown sugar, cinnamon, ginger, or orange to add one-of-a-kind flavors to traditional dessert recipes. After giving squash a try, you’ll never struggle to get vegetables into dinner ever again. Find squash and all the fixings you need to make any delicious squash recipe for a great deal at a Reams grocery store near you!